Don’t you want to Be A Gator? We certainly do! 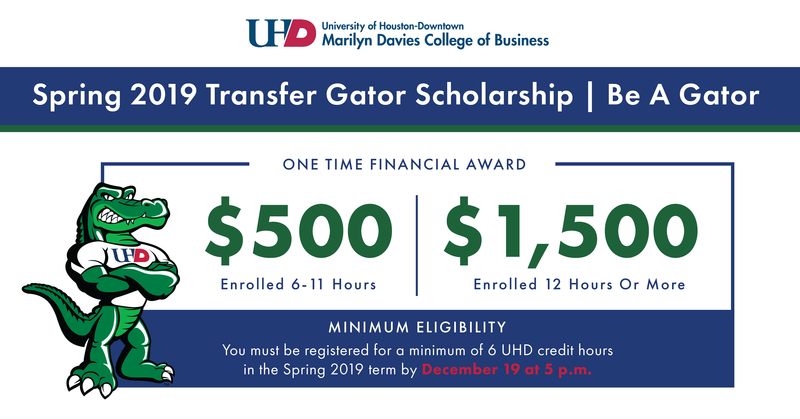 The University of Houston-Downtown is pleased to offer the Be A Gator Scholarship for the Spring 2019 semester. Scholarship amounts will vary depending on how many hours you enroll in. This one-time financial award will assist with covering the cost of your tuition and fees at the University of Houston-Downtown. To meet eligibility requirements for this scholarship, you must be registered for a minimum of 6 UHD credit hours in the Spring 2019 term by December 19 at 5 p.m. Once you accept the scholarship, the award will be applied to your account within 2 weeks. Meet with an academic advisor prior to enrolling in classes to discuss your degree plan and course selection. The office is located on the 3rd floor of the One Main Building in N320. For questions, you may contact the AAC at 713-221-8006 or via email at uhdadvising@uhd.edu. Register for your spring classes! Lock-in your classes by selecting an Emergency Deferment payment option. There will be a $24 set up for the Spring 2019 semester. Pursuing an online-only degree? If you plan to complete your degree 100% online, please email orientation@uhd.edu for your online only request. Taking courses at an off-campus location? If you plan to complete your UHD degree at one of our off-campus locations, please contact the appropriate advising center or drop in for advising.Monday – Thursday: 8 a.m. to 6 p.m | Friday: 8 a.m. to 5 p.m.